Brand new vessel optimized for expedition cruising to feature extreme amenities and "toys," massive penthouse suites and thrilling global itineraries. Just announced yesterday (March 14, 2016) Crystal Cruises will be launching the world’s first purpose-built polar class mega yacht. Months after the successful launch of Crystal Yacht Cruises 62-guest Crystal Esprit, and in response to traveler's feedback and enthusiasm, the "World's Most Awarded Luxury Cruise Line" is again upping the ante with the world's first purpose-built polar class megayacht. Measuring 600 feet (183 meters) long, the 25,000 gross ton new build with 100 guest suites will be the largest and most spacious megayacht afloat. Measuring 600 feet (183 meters) long, the 25,000 gross ton yacht with 100 guest suites will be the largest and most spacious mega yacht afloat, the company claims. The announcement was made at a press event at the annual SeaTrade Cruise Global convention in Fort Lauderdale, Florida. This mega yacht will be named Crystal Endeavor, after Captain James Cooks’ research ship “HMS Endeavour,” which discovered Australia and New Zealand nearly 250 years ago, the newly-built vessel will be designed for global expedition in Arctic, Antarctic and tropical conditions. With the state-of-the-art offshore dynamic positioning technology, Crystal Endeavor will cruise in the Arctic; then follow the route of migrating whales along the coast of the Americas and Europe to Antarctica during the winter. Along the way, she will visit remote islands in the Atlantic and the Pacific Oceans, which cruise ships seldom call or cannot access. With a Remote Operated Vehicle (ROV, used extensively in the offshore industry), expedition cruises will also be organized to see sunken galleons, warships and passenger ships, such as the Titanic at 12,500 feet, and with dynamic positioning, she will just hover over deep sunken attractions without using anchors. Crystal Endeavor, which will be built by the Lloyd Werft Group, will debut in August 2018. 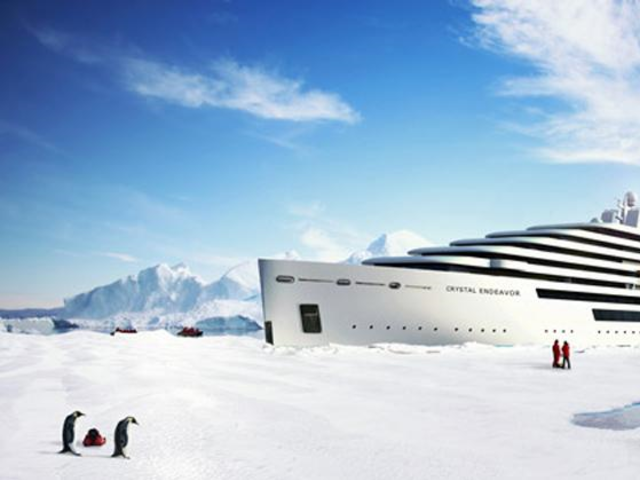 Photo Credit: Rendering of MV CRYSTAL ENDEAVOR on ice. Courtesy of Crystal Cruises.